This is one of our recent projects for a property development company in the heart of London. 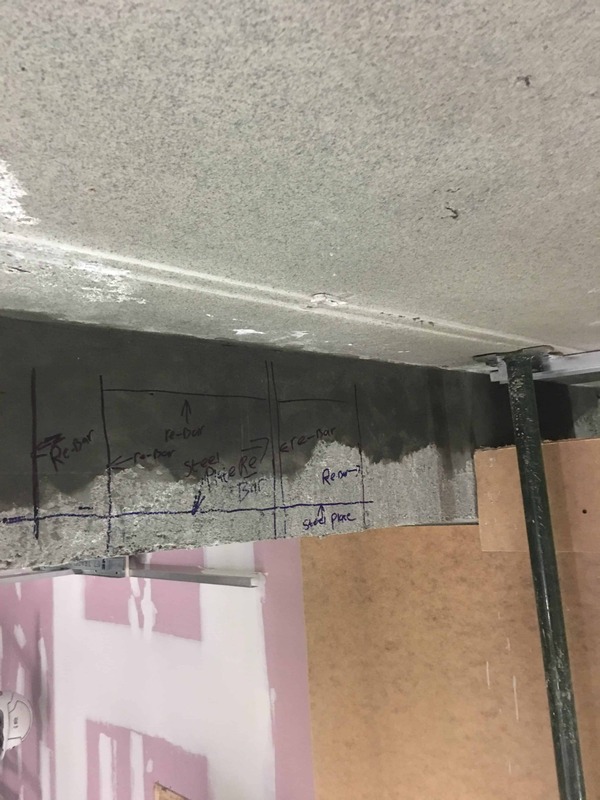 London Structural Repairs were asked too provide a failed concrete beam repair solution to a 6 metre reinforced concrete beam which had damage to the top section. The client was worried about the beam collapsing so LSR operatives fitted RSJ’S with propping to a engineers specification to stop any chance of the concrete beam from collapsing or cracking during our remedial works. The on site engineers asked LSR if we could Hilti Ferroscan The failed concrete beam as well as the two concrete columns connected to the beam to see the steel reinforcement make up as well as to determine bar sizes which the Hilti Ferroscan does with ease but only trained competent persons should attempt to use this complicated piece of kit. The engineers on site presumed that the concrete slab above was tied in connected to the concrete beam but our investigation works confirmed that the concrete slab was not connected and just sat on top of the beams, the slab was probably precast and crane lifted into place at construction. The failed concrete beam Repair solution system we used was Sika concrete repair mortar system. We first carried out a hammer test survey to determine where the defect – delaminated concrete ended and marked this out on the concrete. We then had too saw cut the marked concrete with a dustless concrete grinder attached too a M class hoover to protect all persons within the building from dust inhalation, after this we had too break away the concrete using Hilti mechanical breakers with low vibration to eliminate HAVS to our workers. We then added more steel reinforcement to the repair area and then made the repair using the Sika system to the manufacturers specification. If you have a failed Concrete Beam Repair need carried out then why not give Londons Experts a call.